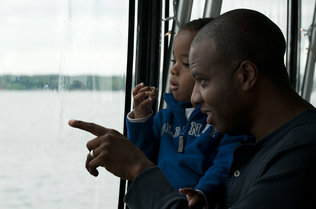 Miles Pierce, 2, secure in the arms of his father, Michael, looks out for Normie from the top deck of the boat. 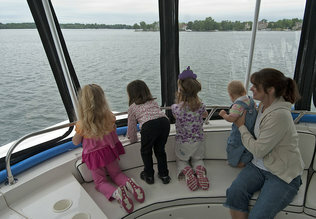 From left, Meagan Boone, 4; Ava Szakaly, 3; Samantha Hays, 3; McKanna Hays, 10 months; and Karyn Hays look out for Normie on the first of many planned summer “Lake Norman Monster Cruises.” On the cruises, families watch not only for Normie the Lake Norman Monster but learn about conservation and the lake-area environment. ON LAKE NORMAN Mallory Suthers knew immediately what she saw when she looked out at Lake Norman from a charter yacht last week: Normie, the friendly Lake Norman monster. Mallory’s brother, Michael, 10, said he spotted Normie farther away, near the dam at McGuire Nuclear Station in Huntersville. Each child I asked saw something different while aboard Cliff Champion’s 100-foot luxury charter boat for the season’s first Lake Norman Monster Sightseeing Cruise. Thirty-three children and parents climbed aboard to hear the legend of the friendly monster from longtime fishing guide Gus Gustafson, who said he’s Normie’s spokesman. About 70 people have recorded Lake Norman monster sightings on the website, which also sells a Lake Norman monster storybook, coloring book, T-shirts, key chains and a monster fishing lure handcrafted by Tackle Town of Maiden. There’s a Normie road-crossing sign, a “Monster Hunting Call” similar to a “fish whistle” toy and a link to a YouTube fishing video featuring Gustafson. “What we’re trying to do is make Normie to Lake Norman what the mouse is to Orlando,” Gustafson said. Last year, Myers branched out with a series of Normie Storytime cruises at Queen’s Landing in Mooresville. Each one sold out. Hating to see children turned away, Myers went to a larger boat this year: Champion’s N 2 Deep in Cornelius. He plans trips throughout the summer. Children on last week’s cruise let their imaginations rule. Explaining where the friendly monster he was hunting came from, Michael Mallory said Normie once lived in a field that was covered over with water to form Lake Norman. “He could be a rat or something and evolved with flippers,” Michael explained. This article is reprinted with permission of Joe Marusak of The Charlotte Observer. To subscribe or to get information on rates for mail delivery, call 800-532-5350 or 704-358-6000. You can also e-mail subscrib@charlotteobserver.com.